Are you finding it difficult to work with your present tattoo accessories? Well, Fresh Jagua has unique tattoo accessories that will make your work easy for you. 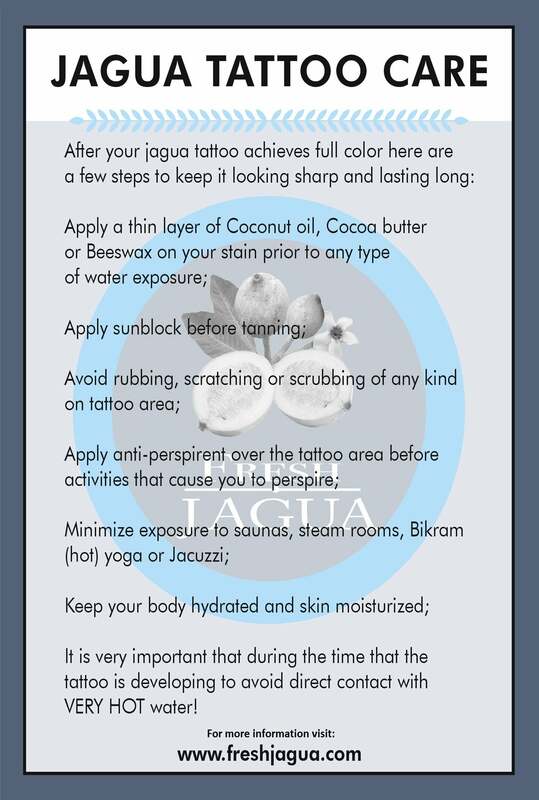 When working with the Jagua ink tattoo gel, you need to be very accurate and precise in order to get the desired designs perfectly. Without the appropriate accessories, work will be difficult and the tattoo designs will be ruined especially complicated designs. One of the accessories that will help you maintain a high level of precision and accuracy during the tattooing process is the use of the right needle applicator. Fresh Jagua provides you our range of accessories such as the 17 Gauge Needle, 19 Gauge Needle, and other sizes of applicator needles. Also, you can choose other accessories from Jagua tattoo supplies such as the Jagua applicator bottle made specially for our Jagua ink gel. You can use the needle base/cap with the right needle to create great Jagua body art designs. It will also save you the risk of spilling the ink while working. Our unique Plastic Dropper will ensure a controlled transfer of essential oil or any liquid to the Jagua ink gel. Designed to twist into our needle base/caps. These stainless steel, blunt ended needles are perfect .. Designed to twist into our needle base/caps. These plastic, blunt ended needles are perfect for all ..